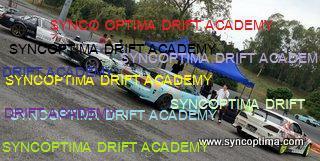 9 students braved the heat to join our first Sync Optima Drift Academy (SODA) held at one corner of car park A in Bukit Jalil while a whole bunch of others were battling it out at the other side during the Fento-D drift session!! The 9; which includes 3 Singaporeans, 1 Autokhana ace ,3 die hard Silvia/180sx enthusiast and 2 relatives ( which one so happens to be a girl), had to go thru 8 hours of grueling drift tutorial which basically covered everything that needs to be known about drifting. Towards the end of the day, a ‘fun course’ was set up for the participants to show off what they had learned.This caused a stir among the spectators as what was showcased wasn’t what you would expect from first timers!! Obviously these people are a talented bunch which I had the hornour to be able to pass on what knowledge that I know, and all I hope is they carry on drifting cause at the rate they picking up stuff, they would give the seasoned pros a run for their money pretty soon!! This entry was posted in Drifting, SODA, Sync Optima Events and tagged bukit jalil car park, bukit jalil drift, drift lesson, SODA drift on April 27, 2009 by skagee. This entry was posted in Blast from the past, Drifting on April 21, 2009 by skagee. click below to find out more !!! This entry was posted in Drifting, Sync Optima Events and tagged bukit jalil drift, drift lesson, drift session, malaysia drift, malaysia drifting, SODA drift on April 19, 2009 by skagee. Never Believe Everything That You Read!!! This entry was posted in Rambling on April 17, 2009 by skagee. This entry was posted in Life Style, Rambling, Skylines on April 16, 2009 by skagee. Having competed in the inaugural MMU DCM Drift Challenge in 2006 but having to miss the following year’s event, it was good to be back for the 2009’s edition. With Cheaka and I now being supported by Goodyear Malaysia and with the addition of Jenshen to our competing Sync Optima/WHAT Team , we felt confident and knew for sure we would have a smashing weekend!! We always have a good time when we go to Malacca; the people here are friendly and the food the is to die for!! Joe Han and Tina were the perfect guides and brought us to some of the best eatery in the historic city!! I would strongly recommend the Lycee and Dragon fruit juice whenever you go down to Jonker street!!! Cheaka, on a combination of Goodyear RS Sports and Revspecs,went strong throughout the event. She did exceptionally well during qualifying ,which was in the wet, where she qualified 14th out of 24 participants. She got a free pass to top 16 when Ivan Lau from Team Bridgestone had some mechanical trouble but narrowly lost out during the top 8 tandem drift battle against the much more experienced Tan Hang Eng!! Jenshen, sporting a newly acquired ‘black out ‘ motif on his drift machine did well by advancing to top 16 by winning his first tandem battle !! I expect his performance will improve even further with a new engine and a few modifications in the chassis department that we have planned. I would have to credit my win to the exceptional performance of the Goodyear tyres , a combination of Goodyear RS sports in front and t Revspecs at the rear. These tires held on really well as I had only used only one pair on the rear for qualifying and tandem.This amounted to 24 runs, which includes 3 practices runs, 2 qualifying runs and 19 warm up and tandem runs!! My part sponsor , team mechanic and friend, Ah Leong (above, far right) had not failed us throughout the event!. Not only had he ensured that everything went smoothly , but he was experienced enough to come well prepared went it didn’t! Thanks buddy! Of course there’s no other way to end the day other then fill our stomach up with good Malacca food.. Gebeh, founder and owner of Tonka exhaust brought Team Bridgestone and us to this famous ‘Satay Celup” joint down town. Please stay tune for more pictures from the event!! This entry was posted in Drifting, General Events, Goodyear, Life Style and tagged drift, drift challenge, Drifting, eagle revspec, eagle rssports, goodyear eagle tires, goodyear malaysia, malaysia drift, malaysia drifting, mmu dcm drift challenge, revspecs, rs sports on April 14, 2009 by skagee.